You'll be £5.20 closer to your next £10.00 credit when you purchase Swansea in the Great War. What's this? The Great War left an indelible mark on almost every town and village in Britain and this extensively researched book looks in detail at how that war affected the town of Swansea and its people. Themes covered in the book include recruitment and the treatment of conscientious objectors, how Belgian refugees were cared for, and what happened to foreign nationals who were living in Swansea at the outbreak of war. How the war affected the trade of the town, especially the docks, is examined, as well as the fate of numerous Swansea ships that became targets for the German U-Boat campaign. The organisation of medical aid for wounded servicemen and the effect of food shortages, and its subsequent rationing in Swansea, are covered. The new roles performed by women and the efforts made in the town to provide support for those left at home, or serving at the front, are also examined. Away from the Home Front, the actions of both of the Swansea Victoria Cross winners are recounted, as are the stories of some of those who served on land, on sea, or in the air. These include a Swansea airman who was downed by the famous Red Baron, another who flew again after losing a leg in combat, a Swansea sailor who was lost in an encounter with a German U-Boat, the Swansea officer who twice escaped from a POW camp, and several former Swansea men who returned with Canadian, Australian or South African units to fight the common foe, with often tragic results. There are also stories of a Swansea nurse captured by the Austrians in Serbia, and a Swansea doctor at Gallipoli. Swansea in the Great War is a welcome and long overdue look at how the Great War affected the town and its people. A fascinating work about the influence and effects of war on the city......wide ranging and highly readable. It is a tribute to Swansea and its people - and a good, absorbing and well-illustrated read. Top class. An important study....... 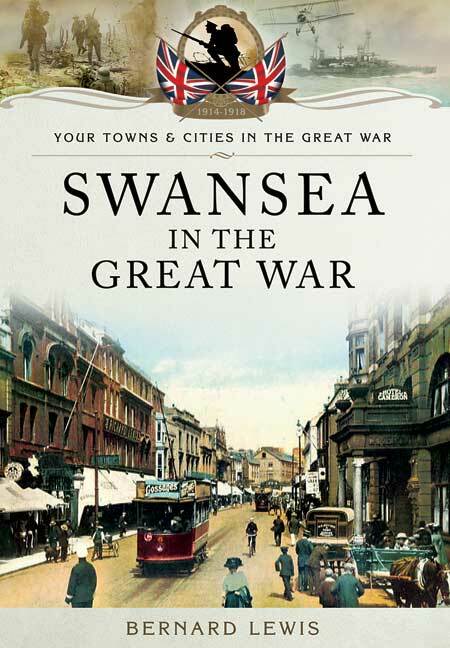 The numerous and varied themes in this book combine to make it an extremely comprehensive account of how Swansea was affected, in so many ways, by the impact of the Great War... A very readable work of high scholarship.... Outstanding. Swansea in the Great War is the product of more than a year's research in local archives and contemporary press reports, and also includes information received from many relatives of those who lived in Swansea, or served at the front, during the war. Bernard Lewis is a retired local government officer who lives in Neath, West Glamorgan. He was born in Swansea and worked for the city council for over 40 years before taking early retirement in 2009.